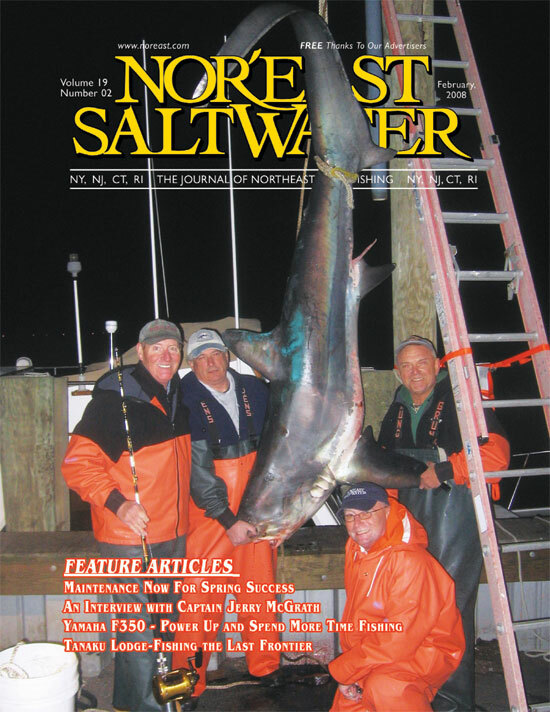 One of the highlights of the 2007 shark season was the amount of monster threshers that were caught. This 339-pound beauty was captured on November 12th by an all FTC crew as well as an all Noreast.com member crew. They were aboard Captain Larry’s vessel the Kristen and the fish was caught in the vicinity of the 20 mile wrecks SE of Jones Inlet. The rod used was a custom Sea Isle, paired with a Penn 50 vsw spooled with 80# High Seas Quattro. The proud anglers are: (left to right) Mike Sullivan, a.k.a. Bluejacket, Matt Errett, a.k.a. MakoMatt, George Sincero, a.k.a. wa2kop, and Captain Larry Festa, a.k.a. Captain Larry. Mike was on the rod 90 minutes, Matt wired the fish, Larry gaffed him and George was at the wheel of the boat.